Ahead of Vermintide 2’s release date early next month, the original game is receiving a free DLC release. Vermintide: Waylaid will bridge the narrative gap between the first and second games, and is available for free with patch 1.11. 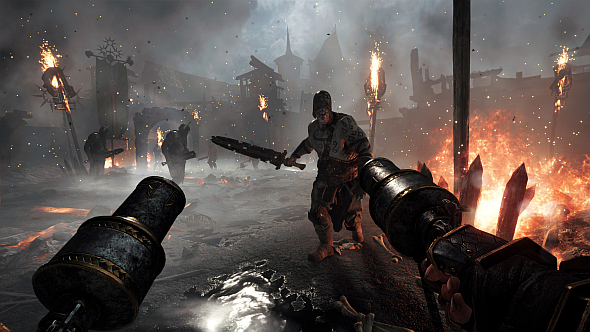 Here’s everything we know about Vermintide 2. An announcement made via Steam last night confirmed that Waylaid, the latest release for Vermintide, is available now. At this point, details about the release are pretty scarce, but the setup should be pretty familiar to fans. The patch post says that “Lohner has a new task for you. No doubt you’re off to some forest to kill rats, right? Maybe the old goat ‘lost’ some more incredibly dangerous relics?” I don’t know about you, but that feels like a pretty big hint to me. Unfortunately, the release of the DLC doesn’t seem to have been without a few problems. Players on Reddit and Steam who have pre-ordered Vermintide II are reporting that they’ve lost access to the Death on the Reik DLC that was released as a pre-order bonus for the sequel. Fatshark say that they’re aware of the issue, and are investigating the problem. The patch notes also note several bug fixes and tweaks, primarily focused on The River Reik map, which likely contributed to the issues. Vermintide II will release on March 8, but as you’re hopefully aware by now, is available for pre-order on Steam, with a pleasing 10% discount thrown in for good measure. Here’s what Fatshark’s stake in their own future means for the sequel.